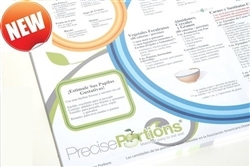 Take the guesswork out of appropriate portion sizes with this stylish portion control dish set from Precise Portions. The Precise Portions Complete Lifestyle Starter Set includes every tool you need to develop or maintain your complete nutritional strategy. All Precise Portions dinnerware are marked with recommended portion sizes and food measurements for adults. These are based on the most up-to-date guidelines from the USDA MyPlate Initiative, as well as the Academy of Nutrition and Dietetics and the American Diabetics Association. Nutritionists and dietitians agree: The best way to manage your weight, blood sugar, metabolism, and blood pressure is to eat healthy foods in the right portions. Crafted from beautiful porcelain with portion control markings artfully disguised within an attractive design, these are dishes you can be proud of whether youÕre having a quiet meal by yourself or entertaining the most refined company. 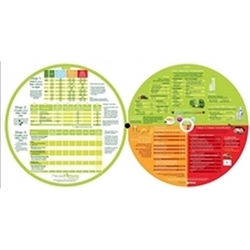 The 9″ FOCUS Portion Control Dinner Plate has helpful dietary guidelines printed right on the plate. Just follow the recommendations, and stay inside the lines when serving up your meal. The 10″ LIFE-style plate is the portion control dinner plate you graduate to once you have mastered the principles of the FOCUS plate. Choose the foods you enjoy, place them on the appropriate section of the plate, and keep them inside the lines. The same goes for sweet treats. As long as you keep your favorite sugar-free desserts within the lines on your 6″ Portion Control Dessert Plate, youÕll still be faithful to your nutrition action plan (assuming your daily calorie budget allows, of course). Your 18oz Portion Control Cereal/Soup Bowl is decorated with ? Cup, 1 Cup, and 1? Cup measurements artfully integrated into a leaf design. Fill your bowl to the level you need, and enjoy your food without the guess work. 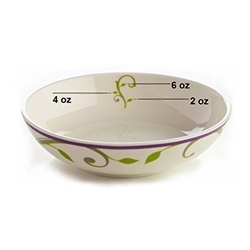 Do the same for your 8oz Snack Bowl, which is clearly marked into 2oz, 4oz and 6oz measurements. Your 10oz Portion Control Beverage Glass is decorated with 4oz and 8oz measurements clearly yet discreetly marked to guarantee youÕre drinking the correct amount of fruit juice or low fat milk each and every time. Maintain portion control even on the go with the Go Healthy Travel Pack. Throwing a party or having a picnic? Check out the Disposable Portion Control Plates, Cups, Bowls, and Side Plates. 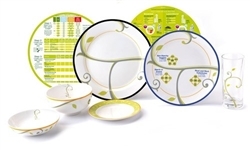 All Precise Portion dinnerware is developed by Registered Dietitians/Certified Diabetes Educators using the best science and the most current nutritional guidelines from the Academy of Nutrition and Dietetics, the American Diabetes Association, and the USDA MyPlate initiative. ItÕs proper nutrition control that’s simple, effective, and guest-friendly.